WOW air is to become the first airline in Europe to operate Airbus’ new A321neo aircraft following an acquisition deal between the Iceland’s low-fare transatlantic airline and the aircraft manufacturer. The new aircraft will enter service in July, joining WOW air’s current all-Airbus fleet of 17 aircraft and will operate on various European and North American routes, including the recently announced new service to Tel Aviv. 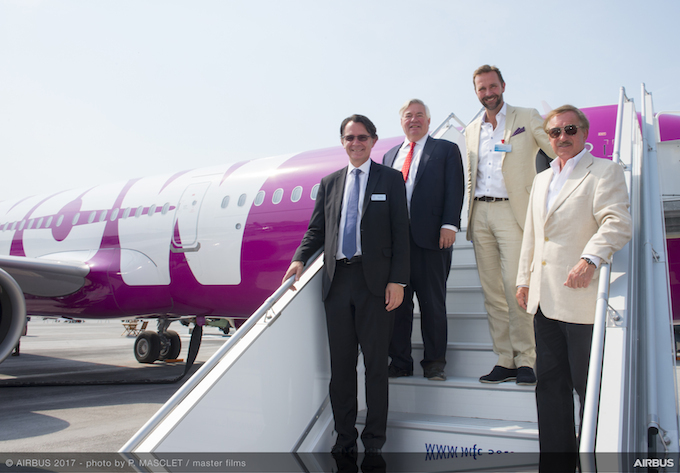 Steven F. Udvar-Hazy, executive chairman of Air Lease Corporation, said: “This first new A321neo delivery for ALC in Europe illustrates our strong and growing relationship with WOW air. We are honoured to be associated with the success and network expansion of this consumer-friendly, cost-efficient and environmentally-conscious airline, which in a short period of time has become one of the most innovative air carriers serving Europe and North America. The efficient, single-aisle jetliner will have a configuration of 218 seats and advance the airline’s move towards reduced fuel consumption, further reinforced by the recent addition of an A320neo to its fleet. John Leahy, COO-Customers, Airbus Commercial Aircraft, said: “The A321neo will allow WOW air to further expand its network in Europe and North America, with the most comfortable and fuel efficient aircraft in its class. Moving away from WOW air’s tradition to name its fleet after family members, the new aircraft will be christened TF-SKY and is set for its inaugural flight on 5 July 2017. For more information, visit www.wowair.co.uk.